An exhilarating theme park, enormous aquarium, flight simulators and other diversions will keep students engaged at the nation’s largest shopping mall. Hearing the words “Mall of America®” will most likely bring to mind one thing in particular: an extravagant shopping trip. With no state sales tax on clothing or shoes and over 520 stores to browse through, Mall of America in Bloomington, Minnesota is the go-to destination for the ultimate shopping experience. Besides all the shopping MOA has to offer, it also draws student groups with a plethora of exciting attractions. While younger crowds might tire of endless shopping, there are attractions suitable for all ages and with a variety of activities to choose from. MOA will keep student groups busy for hours on end. 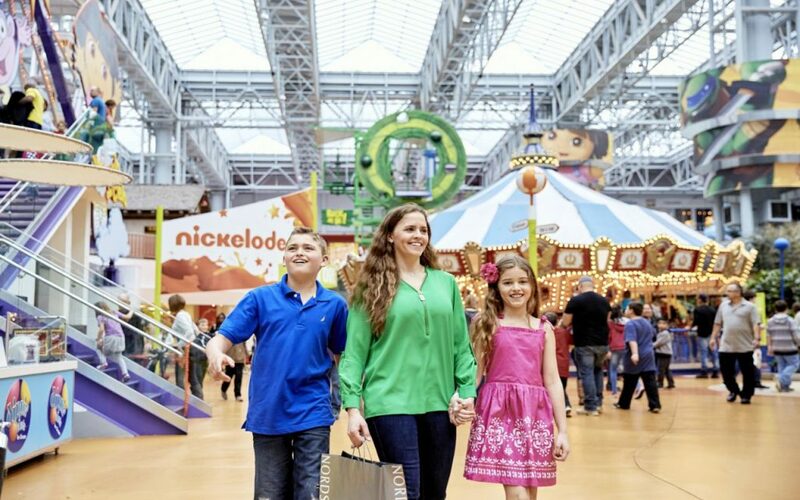 The largest indoor theme park in the nation, Nickelodeon Universe offers seven acres of unique attractions and entertainment, including thrill, junior and family rides for a fun-filled day at the center of MOA. Reaching heights of 70 feet while air and fire forces rage in battle around you, Avatar Airbender is a thrill ride sure to excite student groups. Teenage Mutant Ninja Turtles Shell Shock takes groups through a number of flips and twists at dizzying speeds, ideal for the most daring group members. For younger students, Pineapple Poppers, Rugrats Reptarmobiles and Diego’s Rescue Rider offer more relaxed adventures. The great thing about Nickelodeon Universe is that there’s something for all ages, sizes and desired thrill levels. The popular theme park offers student groups of 15 or more discount prices for three-hour, five-hour or all-day unlimited-ride wristbands. The park is open Monday through Saturday from 10 a.m. to 9:30 p.m. and Sundays from 11 a.m. to 7 p.m. Sharks, sea turtles, stingrays, jellyfish and seahorses are a few of the many exotic underwater animals that can be seen at SEA LIFE. Besides gazing upon these wondrous animals, student groups can partake in a number of interactive activities, including touch pools, stamp stations and the all-new Shark Discovery. 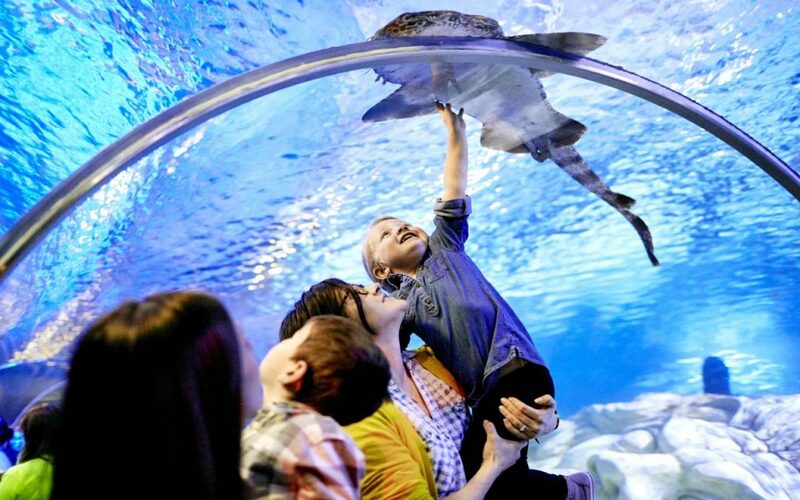 Discovery’s Travelchannel.com has named SEA LIFE the “World’s Best Shark Encounter” and Animal Planet has called it the “best shark exhibit on the planet.” Students can snorkel with the fish, feed stingrays and even enjoy an overnight sleepover at SEA LIFE. Groups can also arrange private animal feedings. Discounted admission is available for groups of 10 or more. The aquarium is open Monday through Thursday from 10 a.m. to 7 p.m., Friday and Saturday from 10 a.m. to 8 p.m. and Sundays from 10 a.m. to 6 p.m. Ever dream of soaring over North America’s most celebrated and breathtaking landscapes? FlyOver America makes this possible through a flight simulator ride that takes groups on an aerial tour of the greatest landmarks and regions throughout the United States utilizing virtual flight technology. To provide groups with an authentic and immersive flight experience, the attraction even includes wind, mist and scents throughout the ride. Students will strap in to a suspended chair with their feet dangling in front of an enormous spherical screen. Tranquil lakes, snow-capped mountains and bustling urban cities are some of the sights one can expect to experience on this one-of-a-kind adventure. FlyOver America offers special rates for groups of 15 or more and is open Monday through Saturday from 10 a.m. to 9:30 p.m. and Sundays from 11 a.m. to 7 p.m.
A favorite with younger group members, Crayola Experience at MOA allows students to embark on a vibrant adventure mixing color, chemistry and digital technology. The attraction includes more than 25 hands-on activities. Student groups can learn how crayons are made during a live show, take photos of themselves that can be converted into their personal coloring pages, name and wrap their very own Crayola crayon or indulge in a 4-D coloring experience. With 60,000 square feet of attractions, student groups can easily spend up to four hours at the Crayola Experience. The Activity Studio features “cut, color and paste” projects, with themes changing regularly and ranging from rock star and jungle explorer to superhero gear, to name a few. Student groups of 15 or more will receive discounted prices. The hours are Monday through Saturday from 10 a.m. to 8 p.m. and Sundays from 10 a.m. to 7 p.m.
For a more educational-based experience, Minnesota Children’s Museum offers hands-on learning in a variety of subjects. Students can travel back in time to a medieval village with opportunities for problem solving, storytelling and imaginative play. Kids can try on different costumes and roll play as lords, ladies and castle villagers, craft their own miniature community and even entertain the royals with a puppet show in the Royal Theatre at the Amazing Castle exhibit. At Ball-a-Rama, students have the opportunity to partake in hands-on physics experimentation. Groups can create whirling spirals that demonstrate momentum, friction and gravity by sending balls down a funnel, or discover the mystery behind rollercoasters using balls, energy and momentum. The museum is open Monday through Friday from 10 a.m. to 8 p.m., Saturday from 9 a.m. to 8 p.m. and Sundays from 9 a.m. to 7 p.m.
Another fascinating flight simulator experience, A.C.E.S. Flight Simulator Center takes groups on a unique adventure with duplicates of simulators used to train military pilots. Students can fly both modern F/A-18 Hornet jets or classic WWII fighters, such as the P-51 Mustang and F4U Corsair. This attraction is ideal for history buffs, and students can choose between over 250 different fighter jets. Students can even fly air combat against each other in adrenaline-pumping dogfights that let you relive WWII history, all while making a bit of your own. Groups are welcomed with open arms, and the attraction’s hours are Monday through Saturday from 10 a.m. to 9:30 p.m. and Sundays from 11 a.m. to 7 p.m.